The Ike's Small Engines, LLC Team recognizes the importance of providing quality service to extend equipment life. 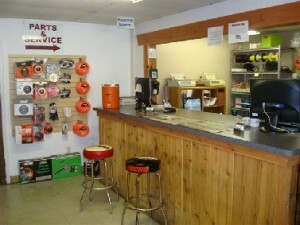 We at Ike’s back our high quality products by offering our customers a full line of parts and service. This is often overlooked, by the buyer, when purchasing any product with a gasoline engine. Also with your purchase from us the equipment will be fully assembled, serviced, and adjusted at no additional cost. We personally instruct all customers on proper starting and operating techniques. In addition we file and register all warranty and completed paper work in our computer so that our customer will not have to locate their proof of purchase if ever they need parts, service or warranty work done. At Ikes Small Engines we do not follow the trend of cheap plastic throw away equipment. We provide long lasting, durable and quality equipment to our valued customers. We are a parts dealer and warranty location for Briggs and Stratton, Kohler, Tecumseh and Honda Engines. We sell parts for Scag, Echo, Shindaiwa, Toro, Honda equipment, Briggs and Stratton, Kohler Engines, Kawasaki Engines, Honda Engines, Snapper, Troybilt, MTD, HOP, Rotary Parts, Hydrogear, Zama, Walbro and Murray. When your looking for mowers and trimmers with the best combination of power and performance, quality and durability, you won’t find a better solution than the complete line of premier equipment at Ike’s Small Engines LLC. All products sold at Ike’s are industry leaders. We carry a complete line to suit just about anyone’s needs. Call us (979) 775-2124 for more information. Copyright © , Ike's Small Engines LLC All rights reserved.